Dogs entering this program should be at least six months of age. This course will usually take anywhere from three to four months to produce a dog that is started and ready to go to the field. This depends largely on the natural ability of the individual dog and their readiness to learn when they come into the kennel. All dogs will be evaluated at the very beginning of the program to determine their individual needs and to reveal any faults or serious training problems that may exist. If problems do exist, they will be brought to the attention of the owner immediately and a course of instruction for that dog will be devised to correct the situation. If, at any time, we feel the dog is "unfixable", we can finish out an obedience course and send the dog home as a suitable pet or companion dog. 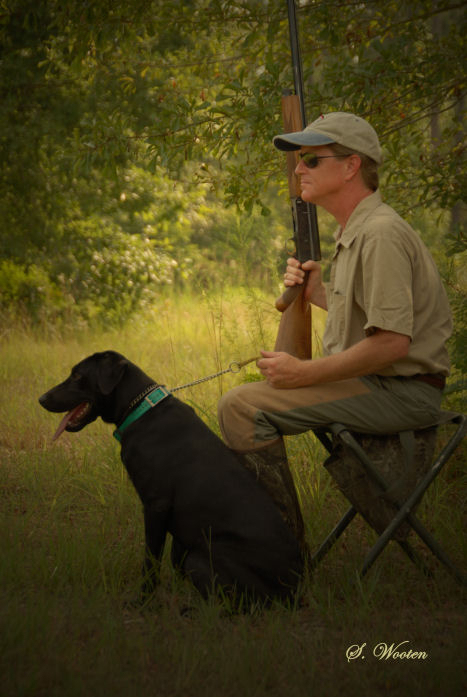 Your dog -started and ready to go into the field - should: be doing nice singles and doubles on land and in the water; be steady and honor while other dogs are working; retrieve and deliver the bird to hand. 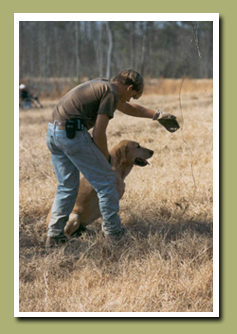 All dogs are worked on different types of land and water areas suited to their level of achievement at the time. 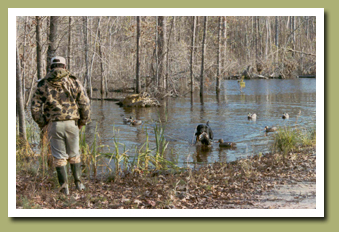 Challenging types of cover on land, water obstacles, duck blinds, decoys, calls and boats are used daily. Pigeons and ducks are the game of choice for training. Pheasants may be ordered by special request. We recommend that you,the owners, do not come to visit for the first three weeks so that we may develop a good rapport with your dogs and get them off to a good start. After that, we encourage our owners to come as often as possible to work with us, one on one, to make sure that we are all on the same page as far as commands and expectations. Our trainers here all use conventional training methods - primarily consisting of patience, repetition, consistency and praise. We do have a complete e-collar program for the dogs needing this for competitive events and where necessary for the safety and handling of special or difficult situations. Click here to return to the Basic Obedience Training. Click here to proceed to Handling.